The selection of teriminal material is often a reflection of collection experiences mixed with good and bad, other people’s opinions, what was bought or available, et cetera. There are some studies, but how do you integrate these reviews with one experiences and opinions? In general, I have been happy with what I carry, but felt there was one hole – what is the best material for swinging flies on the top or in bright light. First lets state leaders and tippet for trout fly-fishing, dry and nymphs, are different than when swinging a fly, whether for bass, steelhead and trout. Fine and supple at the end is important for your traditional trout fishing, as we want the impact of the leader-tippet to be neglible and ability for fine-good knots is a consideration. But when swinging a fly, we want to guide and manage the fly (streamer, wet, lure (whatever)), so a solid and control connection is important. And when going deep, so is strength and durability, as we manipulate through rocks, logs, et cetera. Traditional RIO Leader Nylon for Trout Dry and Nymphing – feel no need to change. 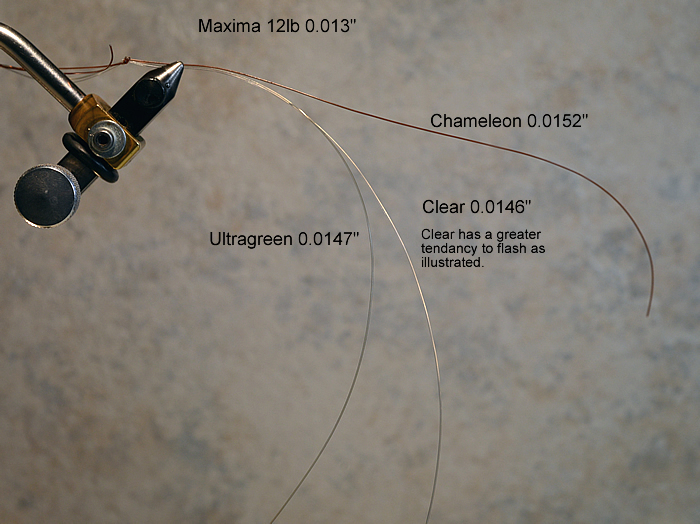 Maxima Chameleon – for swinging a fly on dark days or deep. It is strong and stiff, so it guides a fly well. It knots well, but being dark, it is not the best for bright days or on clear water at the top. I really like this material. Been using Seaguar Fluorocarbon for these bright days, but Maxima promotes UltraGreen and Clear, with Clear being the “clear” version of Chameleon. Though I have collected spools here and there, but not in away to do a personal review and comparison off the water. Given my like for Maxima Chameleon, I thought it was time to validate their brethen – Clear and Ultragreen – and apply some careful observations. Samples: So I have started with a common weight (12# 0.013″ diameter) and bought 1 new spool from Mike (Poppy) at the Red Shed of Maxima’s Chameleon, Ultragreen and Clear. The first yard on the spool was discarded, with a 2 yard sample taken from each spool. The samples were stretched by hand (25 pulls), warmed for 24 hours in a warm box at 32C (90F), and then streteched again (25), to reduce memory. Of course, this study has limited statistical value, as it one spool from one store, with 1 2 yard section. It is possible, I have an atypical sample. First, actual diameter. In building a traditional leader, stiffness and managing the diameter is critical, but with swinging a fly at the end of a tip, its significance is much lower. I note this, as some criticize Maxima for understating their real diameter, but I maintain this criticism is overstated given how the material is used. Point: If you are building a traditional leader, you should be using a guage. I used a micrometer with a singular resistant setting to measue the thickness on the strengthen samples at 10 random locations to validate variances. The variances across the sample was neglible and within measurement error. One non-repeatable measurement as off by 0.0004″ and was discarded. Conclusion: Confirms that Maxima does understate the actual diameter and my sample of Chameleon is a little larger which may impact the following stiffness and durability test. The inability to measure a true variance is good news. (Variances led to concentration of stress and will result in an early fault). Second, stiffness: Use gravity to validate a materials stiffeness. Result: The above picture speaks for itself. Conclusion: Chameleon is stiffer and still shows some memory, the additional thickness may have some bearing on the results, but not likely to reflect this difference. Third, durability: Not having the right equiment (load cell with programmable arms), I stress the three samples across the back of a scissors with a stroke of 20cm. 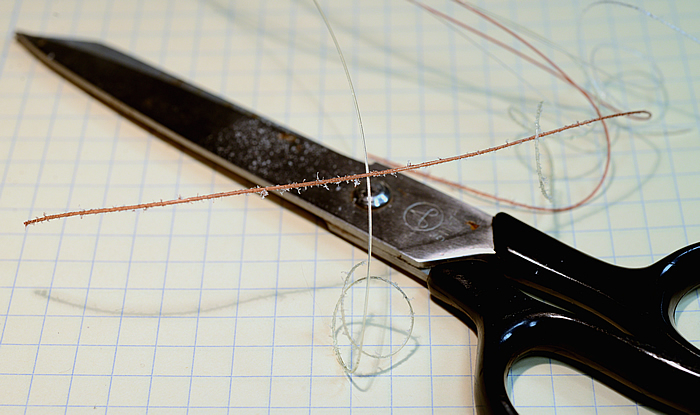 The stress was by hand and I tried to approximate the force used when pulling back hard on a steelhead. Result: All samples broken between 38 to 41 complete strokes. Conclusion: I contend this small variance is within the error of test, so effectively, the durability is the same, and thus have intentionally not reported order of breakage. Not tested: I have not tried a quantative break test. I believe this is more complicated that it would seem and to be honest, I have seen nothing to suggest I have an issue here. If I was going to do any test, I would execute a qualitive test with a tippet tied to a fix point and try to pull it in with the rod. Thus trying to correlate a lines rated strength to a static pull. I might do this, validate how small of a tippet I could get a way with in a fight, or how they correlate, but I would want samples of the same material at different diameters. Continue with Maxima Chameleon for the those dark days or dark pools. If using nylon in the top water or clear pools, use Ultragreen. Clear offers no advantage and appears to have a greater propensity to reflect (flash) light than Ultragreen. Keep in mind, finer tippets may be harder to see, but you loose control of the fly.